To crop a photo means to trim away some of its perimeter. Cropping out excess background can often improve an image. With the Trim function on the Nikon D3400’s Retouch menu, you can crop a photo right in the camera. However, always make this your last editing step because after you crop, you can’t apply any other fixes from the Retouch menu. Display your photo in single-image view, press the i button, select Retouch, and press the Multi Selector right. Select Trim and press OK.
You see the screen shown. The yellow box indicates the cropping frame. Anything outside the box won’t appear in the cropped photo. You can crop to one of five aspect ratios: 3:2, 4:3, 5:4, 1:1, and 16:9. The selected aspect ratio appears in the upper-right corner of the screen. 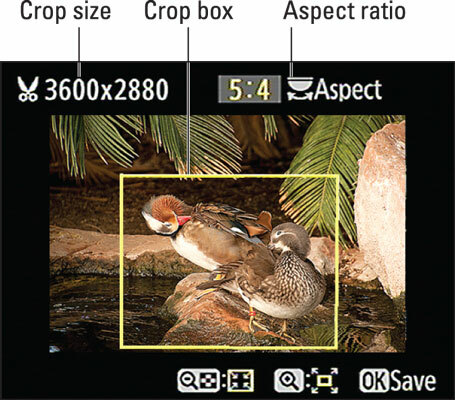 For each aspect ratio, you can choose from a variety of crop sizes, which depend on the size of the original. The sizes are stated in pixel terms, such as 3600 x 2880. If you’re cropping in advance of printing the image, remember to aim for at least 200 pixels per linear inch of the print — 800 x 1200 pixels for a 4 x 6 print, for example. The current crop size appears in the upper-left corner of the screen. Enlarge the cropping frame. Press the Zoom In button. Reposition the cropping frame. Press the Multi Selector up, down, right, or left to shift the frame position. Press OK to create the cropped copy. When you view the cropped image in Playback mode, a scissors symbol appears next to the Image Size readout (lower-right corner of the frame) to tell you that you’re looking at a trimmed photo. The yellow box indicates the cropping frame.